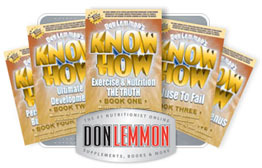 Nutrition Consultant Interview - Nutritionist, Exercise Specialist, Health & Fitness Author, Weight Loss Expert, Don Lemmon. News regarding Essential Fats, Multi-Vitamins, Protein Powder, Fat Burners, Bodybuilding & Diet Tips. We expose myths, fads, lies and the truth about Bill Phillips, Suzanne Somers, Richard Simmons, Barry Sear, Dr. Atkins and other scams! QUESTION: What is your opinion of Bill Phillips? Nutritionist Don Lemmon: I admire him. His marketing is brilliant. He is a walking billboard of success, but he is also very deceitful. His ads aren't at all truthful and his products are cheaply made than expensively sold. He promotes a healthy lifestyle that requires $300 a month of his junk products and pretends to be your friend. Keep in mind, this guy used to be a steroid dealer. I have as little personal respect for that as I do for Met-RX. What does �met� stand for in medical terms? Metabolic. What does �RX� stand for in medical terms? Prescription. So why do they call it �Mettrex� or �Met-Rx� instead of �Metabolic Prescription?� Because it's NOT a metabolic prescription and that would be all out false advertising. The same can be said for EAS which stands for Experimental (meaning no one is SURE of anything it does), Applied (meaning someone has foolishly used it), Sciences (anything that requires work can be deemed a science). Do you really want part in applying an experimental science? The guy is flat out telling you his stuff is a scam. EAS is the EVIAN of its era (evian spelled backwards is NAIVE meaning you are NAIVE to believe what they say is in the bottle). Met-RX, EAS, and Bill Philips are all hype. They could've done good things for people but chose not to. In fact, one of his biggest spokesmodels, a former Ms. Fitness America, was on my radio show last year telling us all about his faked before and after pictures, cheap products, etc. QUESTION: Tell me about Atkin's, low carb, ketogenic dieting. Nutritionist Don Lemmon: Low carb diets make your skin sag like a wet sock. It's not good for long term health and no one I know personally has succeeded on a ketogenic diet, including Atkins himself who died overweight. His publicists can say it was due to heart medication but he touted his program as heart healthy... catch 22? QUESTION: Tell me about the Glycemic Index. Nutritionist Don Lemmon: If you know something is bad for you, just don't eat it. If you aren't sure what it is you are eating or what's in the food's ingredients, just don't eat it. Is an apple or orange better or worse for you than sugar or juices? Is a candy bar better for you than a steak? Use common sense. That sums up the Glycemic Index. QUESTION: What is your opinion of Barry Sears and his Zone Diet? Nutritionist Don Lemmon: All this guy did was take the typical diet of 20% protein, 20% fat, and 60% carbs and cut the carbs in half. By doing so, this temporarily eliminates half of what people are doing wrong: eating too many carbs. So it works at first for those who started off on low fat diets; however, you can only get so far after you �Enter the Zone� as none of the other necessary changes were ever facilitated. People love to email me and say I am just bashing Barry Sears -- don't take things so personally. You don't know Barry Sears to defend him. He hired a man named Rick Hughes to write the program and Rick is a close friend of mine. I know what I'm talking about. Besides that, Barry Sears has a double chin. I don't. QUESTION: OK, but wouldn't a physician know best? Physicians prescribe stationary bike riding and walking, not weight lifting. Nutritionist Don Lemmon: Medical schools don't require exercise sciences or nutrition as educational courses to graduate -- so no, most doctors don't know best in this area. Sorry. QUESTION: You know, I can't see my abs these days like I used to. Some people say, �Do high reps with no added resistance� and others say, �Add weight to the exercise for lower reps to get the abs looking their best.� Who's right? Nutritionist Don Lemmon: Abdominals require resistance and weights to develop like the rest of your muscles do. Arthur Jones unveiled a Nautilus abdominal machine back in the 1970's that had 250 pounds of resistance on it for a reason. The abs are designed to be strong so they can protect our organs; however, doing endurance abdominal work signals that your organs are under attack so the body works to insulate the midsection by storing fat to protect you. Even if it's just a little fat, over time, a little more at a time, it adds up and without fail, no visible abs after all. Stomach muscles show best from doing short, hard, slow resistance exercises but mostly by following a proper diet. Those of you doing several sets of 100 reps each should have realized by now: it doesn't work that way and it isn't going to. QUESTION: Genetics. Should the less skilled or developed athlete train the same as the more skilled or better athlete? 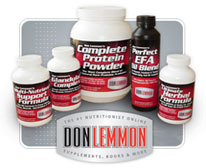 Nutritionist Don Lemmon: Genetics only tell you where and how you will store or build fat and muscle the fastest, not the potential to develop or perform. Sure, some people are 7 feet tall and others 6 feet, both playing basketball, but the shorter man just needs to better himself in some areas to compete. He can't alter his genetics. Gifted people aren't gifted as much as they're simply harder workers than the rest of us. Ever see someone do something cool and say, "I could never do that?" You probably could, had you practiced. The difference between you and the athletes you admire: dedication, effort, and consistency. And while you may have more or less work to do in order to reach your goal than they had, that doesn't mean that you are limited. You just need to get up and do something. Sure, we may never reach the ultimate goal, but it's fun trying and quite an ego boost to see yourself ahead of the others trying. It's no different than people getting their stomach stapled. You know you didn't give it your all. QUESTION: What do you think about stomach stapling and gastric bypass surgery? Nutritionist Don Lemmon: I say get a grip on your eating, not your stomach. Let's be honest, do we know anyone who can say they ate clean food all their lives and still claim their obesity is genetic? No! I understand why people fall for the media hype and medical community's sales pitches but keep in mind, no one twists a person's arm to eat bad when they're about to put something in their mouth. Just being used to eating one way or doing one thing over another isn't a good enough excuse to keep being overweight. People know they need to change something and unfortunately a smaller stomach only means you get to eat half the junk food or other bad stuff that made you fat to begin with. Carnie Wilson has made this program famous. Other celebrities followed, but what do these people look like naked? AWFUL, know what I mean? There has not been one single case where someone came to me considering this procedure that didn't eat foolishly to get where they are. Don't tell me it runs in the family. Eating bad might run in the family, but you don't need to eat like your parents or anyone else for that matter, especially if you see the net result is poor health. QUESTION: Many people say they have trouble building more muscle as they get older and others say they just can't build any muscle at all. They may not have a problem getting lean, but when it comes to building more muscle, they say it's impossible. What are they doing wrong? Nutritionist Don Lemmon: Not eating enough food. Gorging one or two times a day is not the same as eating 6 equally sized and properly formulated feedings. Depending on how they abused their internal systems during their lives, sure, it can be tough to build muscle when components like enzymes and hormones are low but it's still not impossible once you rejuvenate. Even in the elderly, most ailments are typically reversible. You can't become a teenager again, but you can make progress unexpected for someone your age. Training elicits a hormonal response that recharges your hormone levels no matter how old you are. Ever felt nauseated after training? That's your growth hormone levels increasing. Ever felt �testy� after a good workout? That's due to raised testosterone. I worked with Bob Hope's buddy, Morris Sullivan, in LA for a while. His doctor didn't want him to do a thing in the gym let alone change his diet because his blood profile was so awful. This guy had a blood profile of a 93 year old man at the age of 78. In six short weeks, he was doing full squats, benching his bodyweight, golfing, and his blood not only cleaned up but read like that of a 55 year old! It's just a matter of doing something right rather than merely talking about it or continuing down a path which is counterproductive.